This cross stitch quilt pattern is stitched in dreamy magical colors. 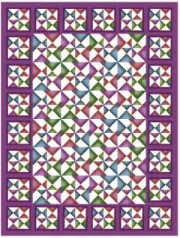 Each block is a unique twist on the traditional quilted pinwheel block. The "twist" creating a larger version of the quilted pinwheel where each block joins. This pattern takes the eye on an enchanted journey. With Supplies: $23.01 You download the design. We will send you, 17 skeins of DMC Floss & Wichelt 14ct. 18" x 21" Aida (Ivory) to complete your project.